The 2017 Panini Flawless Football series is a premium card set with actual gems embedded into the base set. In fact, the set is so premium that the short print base cards are numbered 1/1! Beyond the diamonds, though, is a healthy autograph checklist and some truly stunning patch cards. Autos are exclusively on-card or cut, adding to the high end value of these pieces. Each box contains one pack of 10 cards and there are two boxes per case. Collectors should pull six autographs, two memorabilia, and two gem cards from per box so every hobby box is going to be a fun, but short, crack. 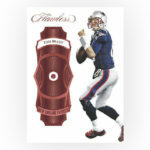 Our checklist includes all of the cards as they are listed officially on the Panini checklist. Actual numbers will appear different on the cards. Follow this hub using the button above and you will get automatic updates regarding this set when they become available via your "Following" page.